Santa and his helper, Holly the Elf, were passing over your island when the unthinkable happens. 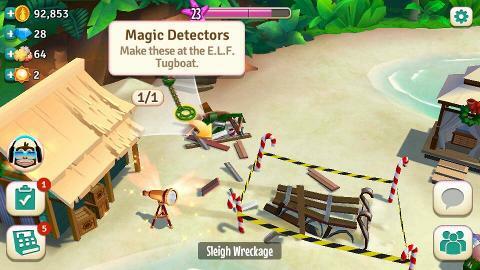 Santa's Sleigh crashes and lands next to your Boathouse. 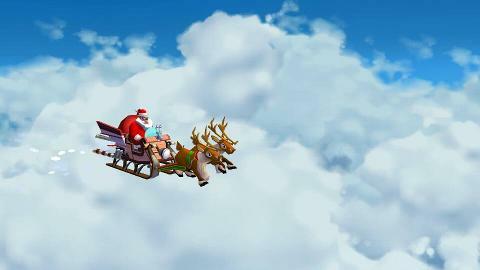 The body of his sleigh is wrecked, his Bag of Endless Gifts is torn, and his reindeer have scattered across the island. 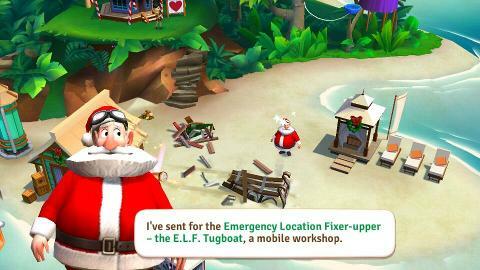 Santa sends for his top mechanic, Jingles the Elf, who brings the Emergency Location Fixer-upper -- the E.L.F. Tugboat -- to assist in repairing the sleigh and the magic bag, but he can only do it with your help. 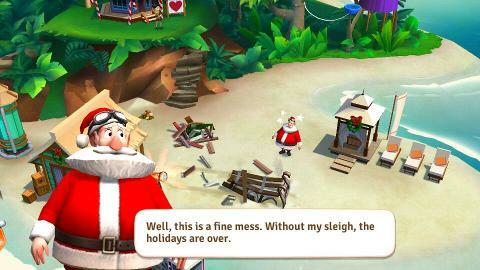 Meanwhile, Santa kicks back on the beach for a nice tropical vacation. But was the crash really an accident? Jingles has his suspicions. Play the quests to find out. 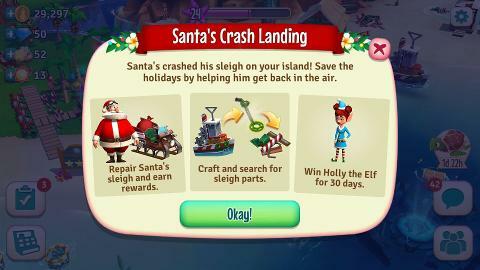 If you’re at least Level 8, you’ll receive a pop-up for the “Santa's Crash Landing” Event. You’ll need to force-close the game to see the update, which means to clear it from your mobile device's memory. You may even need to reboot your device. Start the event by tapping on Santa's damaged sleigh. Next, scavenge for Sleigh parts at Sleigh Wreckage using Magic Detectors. There’s a permanent pile of Sleigh Wreckage near the crashed sleigh. There are also floating piles of Sleigh Wreckage that appear in the water for a short time. Search the waters around your island for floating wreckage. Collect extra parts by using Magic Detectors on floating wreckage before it disappears. 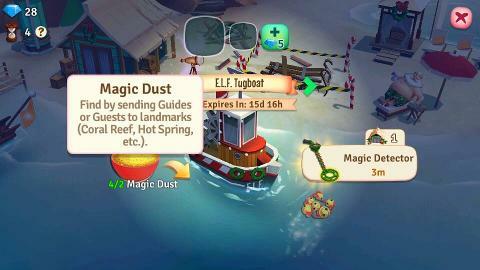 Make Magic Detectors at the E.L.F Tugboat using Magic Dust, which can be found by sending Guides or Guests to the different island landmarks (Coral Reef, Hot Springs, Smugglers’ Cave, etc.). 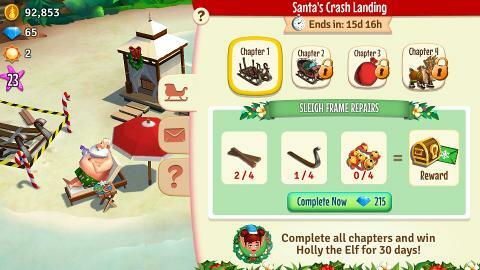 Gather or craft the necessary Sleigh Parts to complete each chapter. Finish Chapter 4 on or before December 30, 2016, and win the exclusive Guide, Holly the Elf, who will stay at your island for the next 30 days. Holly would love to have a warm vacation! 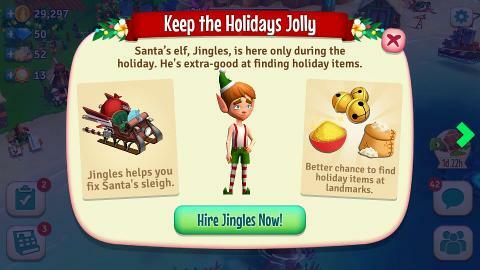 You have the option to hire Santa's Elf, Jingles, as a temporary Guide to help you out during the “Santa's Crash Landing” Event. He’ll give you a higher chance of finding rare event ingredients (such as Magic Dust, Jingle Bells, etc.) at the landmarks. Please be aware that he is temporary, and will leave your Island once the event is over. Receive Holiday Cheer from friends. Be sure to send Holiday Cheer to your friends to help them out. You will also earn Cheer by completing Event Chapters, and have a chance to get Cheer from the Sunken Temple. 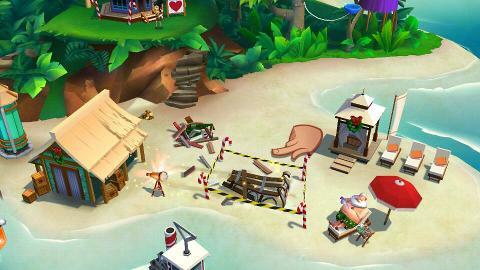 Reach the different milestones to win exciting prizes, including a festive Sandman island decor!